Update: I just realized after reading Helena Puig Larrauri’s excellent post on UAVs for conflict prevention that my post below does not explicitly state that I’m only responding to misconceptions related to UAV-use in response to natural hazards, not armed or violent conflict. Superficial conversations on the challenges and opportunities of using UAVs in humanitarian settings reveal just how many misconceptions remain on the topic. This is admittedly due to the fact that humanitarian UAVs are a relatively recent innovation. There are of course legitimate and serious concerns around the use of UAVs in humanitarian settings. But superficial conversations tend to obfuscate intelligent discourse on what the potential solutions to these challenges might be. I would thus like to address some of the more common misconceptions in the hopes that we can move beyond the repetitive, superficial statements that have been surfacing in recent discussions on humanitarian UAVs. This will hopefully help improve the quality of discourse on the topic and encourage more informed conversations. UAVs are expensive: Yes, military drones cost millions of dollars. But small, civilian UAVs range from a few hundred dollars to the price of a small car. The fixed-wing UAV used by the International Organization for Migration (IOM) in Haiti and by Medair in the Philippines cost $20,000. Contrast this to UN Range Rovers that cost over $50,000. The rotary-wing UAV (quadcopter) purchased by the UN Office for the Coordination of Humanitarian (OCHA) costs $1,200 (the price of a laptop). The one pictured above now costs around $500. (And balloon mapping costs even less). Like other technologies, UAVs are clearly becoming cheaper every year, which is why they’re increasingly used in humanitarian settings. UAVs are limited in range: So are cars. In other words, whether UAVs are “too limited” depends on what their intended use is. Small, fixed-wing UAVs have a flight time of about an hour while small rotary-wing UAVs typically remain airborne for half-an-hour (on 1 battery). Naturally, more expensive UAVs will have longer flight-times. For targeted damage assessments, current ranges are easily manageable with several batteries. With one team and a few batteries, IOM covered 45 square kilometers in 6 days of flying. As more groups use UAVs in humanitarian settings, the opportunities to collaborate on flight plans and data sharing will necessarily expand both range and coverage. Then again, if all I need is 25 minutes of flight-time to rapidly assess disaster damage in rural village, then a rotary-wing UAV is a perfect fit. And if I bring 5 batteries along, I’ll have more than two hours’ worth of very high-resolution imagery. UAVs are dangerous: Cars cause well over 1 million deaths every year. There are safe ways to use cars and reckless ways, regardless of whether you have a license. The same holds true for UAVs: there are safety guidelines and best practices that need to be followed. Obviously, small, very light-weight UAVs pose far less physical danger than larger UAVs. Newer UAVs also include a number of important fail-safe mechanisms and automated flight-plan options, thus drastically reducing pilot error. There is of course the very real danger of UAVs colliding with piloted-aircraft. At the same time, I for one don’t see the point of flying small UAVs in urban areas with complex airspaces. I’m more interested in using UAVs in areas that have been overlooked or ignored by international relief efforts. These areas are typically rural and hard to access; they are not swarmed by search and rescue helicopters or military aircraft delivering aid. Besides as one UAV expert recently noted at a leading UAV conference, the best sense-and-avoid systems (when flying visual line-of-site) are your eyes and ears. Helicopters and military aircraft are loud and can be heard from miles away. If you or your spotter hear and/or see them, it takes you 10 seconds to drop to a safer altitude. In any event, flying UAVs near airports is pure idiocy. Risks (and idiocy) cannot be eliminated, but they can be managed. There are a number of protocols that provide guidance on the safe use of UAVs such as the Humanitarian UAV Network’s Code of Conduct and Operational Check-List available here. In sum, both education and awareness-raising are absolutely key. UAVs are frightening: Compare the UAV pictured above with UN military helicopters and aircraft. What looks more scary? Talk to any UAV professional who actually has experience in flying small UAVs in developing countries and virtually all will tell you that their UAVs are almost always perceived as toys by both kids and adults alike. CartONG & OSM who use UAVs for community mapping note that UAVs in Haiti bring communities together. 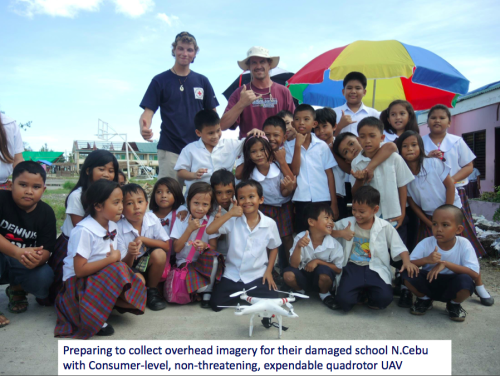 Meanwhile, SkyEye and partners in the Philippines use the excitement that UAVs provoke in kids to teach them about science, maths and aeronautics. Do the kids in the picture above look scared to you? This doesn’t mean that process—reassurance, awareness raising & community engagement— isn’t important. It simply means that critics who play on fear to dismiss the use of UAVs following natural disasters don’t know what they’re talking about; but they’re great at “Smart Talk”. UAVs are not making a difference: This final misconception is simply due to ignorance. Humanitarian UAVs are already a game-changer. Anyone who follows this space will know that UAVs have already made a difference in Haiti, Philippines and in the Balkans, for example. Their use in Search and Rescue efforts have already saved lives. As such, critics who question the added value of humanitarian UAVs don’t know what they’re talking about. Acquiring and analyzing satellite imagery after a disaster still takes between 48-72 hours. And if clouds are lingering after a major Typhoon, for example, then humanitarians have to wait several days longer. In any event, the resulting imagery is expensive and comes with a host of data-sharing restrictions. These limitations explain why disaster responders are turning to UAVs. This doesn’t mean that we don’t need more evidence of impact (and failure), we certainly do since this is still a new space. But suggesting that there is no evidence to begin with is precisely the kind of ignorance that gets in the way of intelligent discourse. I hope we can move beyond the above misconceptions and discuss topics that are grounded in reality; like issues around legislation, coordination, data privacy and informed consent, for example. We’ll be focusing on these and several other critical issues at the upcoming “Experts Meeting on Humanitarian UAVs” co-organized by the UN Office for the Coordination of Humanitarian Affairs and the Humanitarian UAV Network (UAViators), which is being held in November at UN Headquarters in New York. My advocacy around the use of humanitarian UAVs should obviously not be taken to suggest that UAVs are the answer to every and all humanitarian problems; UAVs, like other novel technologies used in humanitarian settings, obviously pose a number of risks and challenges that need to be managed. As always, the key is to accurately identify and describe the challenge first; and then to assess potential technology solutions and processes that are most appropriate—if any—while keeping in mind the corner stone principle of Do No Harm. A colleague of mine at Google recently shared a new and very interesting Web App that tracks breaking news events by monitoring Wikipedia edits in real-time. The App, Wikipedia Live Monitor, alerts users to breaking news based on the frequency of edits to certain articles. Almost every significant news event has a Wikipedia page that gets updated in near real-time and thus acts as a single, powerful cluster for tacking an evolving crisis. Social media, in contrast, is far more distributed, which makes it more difficult to track. In addition, social media is highly prone to false positives. These, however, are almost immediately corrected on Wikipedia thanks to dedicated editors. 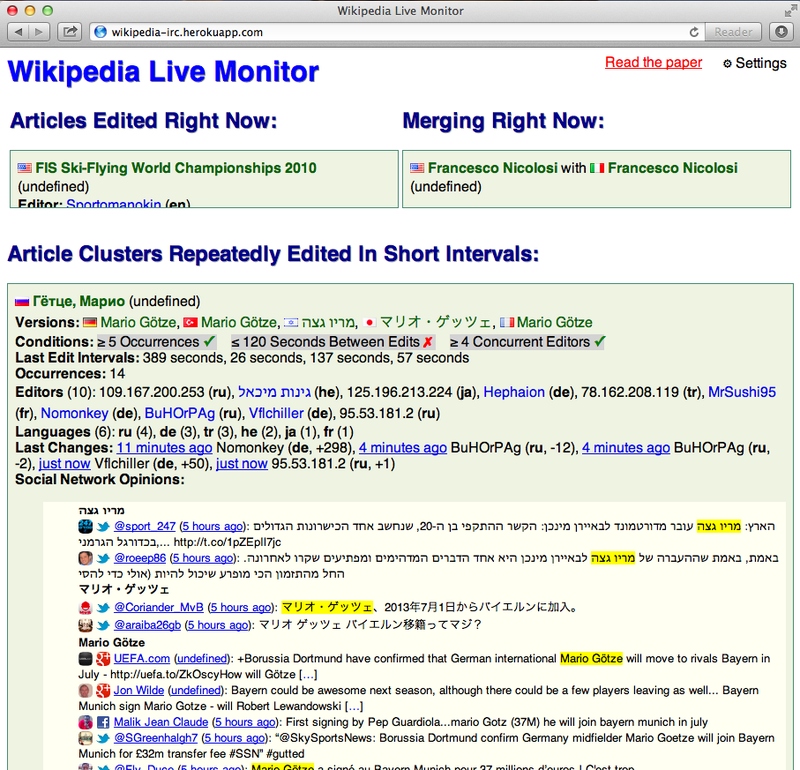 Wikipedia Live Monitor currently works across several dozen languages and also “cross-checks edits with social media updates on Twitter, Google Plus and Facebook to help users get a better sense of what is trending” (1). I’m really excited to explore the use of this Live Monitor for crisis response and possible integration with some of the humanitarian technology platforms that my colleagues and I at QCRI are developing. 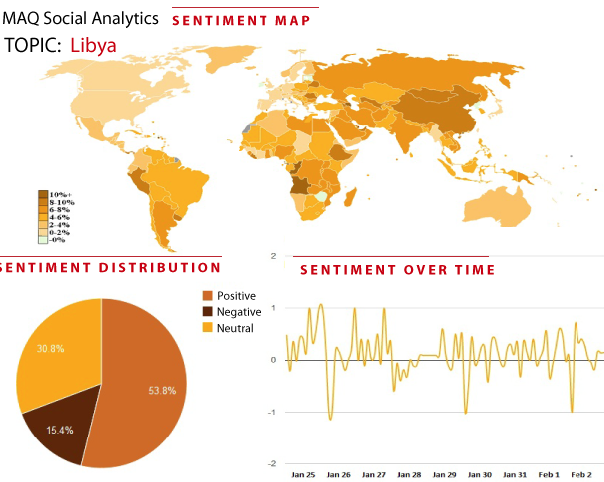 For example, the Monitor could be used to supplement crisis information collected via social media using the Artificial Intelligence for Disaster Response (AIDR) platform. In addition, the Wikipedia Monitor could also be used to triangulate reports posted to our Verily platform, which leverages time-critical crowdsourcing techniques to verify user-generated content posted on social media during disasters.